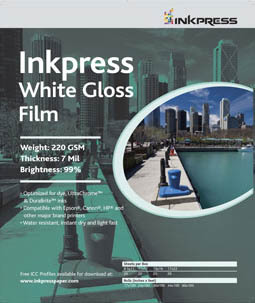 Inkpress White Gloss Film is a whiter, glossier and heavier film. It feels like paper coated in plastic. In fact, anyone that remembers Cibachrome will see a very similar look and feel to that product. This paper truly is waterproof. Try this yourself. Make a print and place it under running water right after printing, and rub it with your fingers. White Gloss film is almost impervious to water and smudging.